Does Creatine Give People Anger Problems? Men commonly take weight-gain supplements with the goal of increasing lean mass. This is typically combined with a resistance-training program to increase strength and muscle size for sports performance purposes. The most common supplements used to increase mass are whey protein, branched-chain amino acids and creatine monohydrate. When taking these supplements, it's best to work with a sports nutritionist. Taking supplements may cause side effects. Whey powder offers a convenient way to increase your protein intake when you're looking to put on lean mass. Whey is composed of amino acids, which are the building blocks of protein. In a study published in the 2013 issue of the Journal of the American College of Nutrition, whey protein caused significantly greater lean mass gains than soy protein. 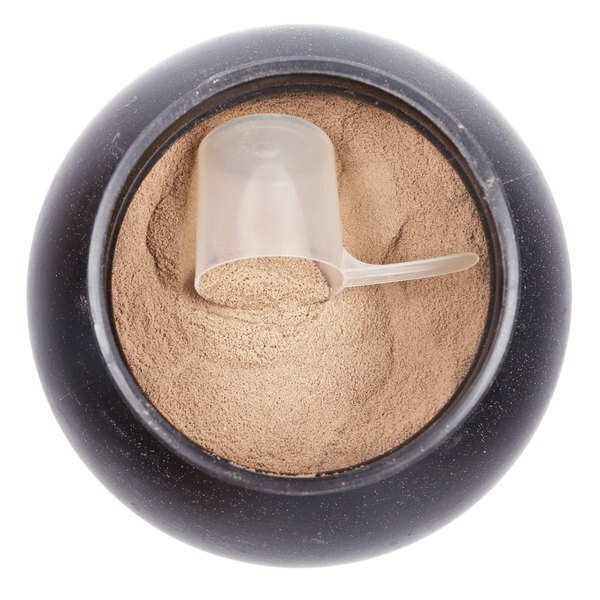 The powder is available in various flavors and is typically mixed with water and used to supplement whole foods by having a shake between meals, according to Arnold Sturtz, author of "The Protocol: The Best Supplements for Building Muscle Mass." The three branched chain amino acids -- valine, leucine and isoleucine -- are so called due to their molecular structure. These three amino acids play a crucial role in muscle synthesis, says Sturtz. Although whey protein contains these three aminos, Sturtz recommends a separate BCAA supplement before and after a workout. This is because the muscles have a high demand for BCAAs during strenuous physical activity and during recovery. When compared to whey protein, BCAA supplementation results in significantly greater weight gain and lean mass gain, according to a study published in the July 2009 issue of the Journal of the International Society of Sports Nutrition. Creatine is a substance that helps supply energy to your muscles. It's available as a powder and typically taken before and after your workout, according to Sturtz. Men who are taking BCAAs commonly mix creatine into their pre- and post-workout drinks. Mixing it with carbohydrates such as apple juice helps aid absorption, says Sturtz. The goal is to supply your muscles with the vital energy they need to power through high-intensity weight training sessions to help bulk up. There is some evidence to support the use of creatine in young, healthy adults, according to MedlinePlus. No serious side effects have been reported in connection with typical doses of whey protein or BCAA supplements in healthy men. However, excessive protein intake may raise the risk of kidney stones. Taking creatine may cause gastrointestinal side effects such as nausea, abdominal discomfort and diarrhea, but these may go away with continued use. In addition, creatine increases your body's water needs, so drink plenty of water to stay hydrated. Creatine draws water into the muscles, which makes your muscles look bigger.